CivilDigital brings you series of frequently asked and discussed multiple choice and interview questions for the benefit of every civil engineering student or job seeker for Interview & Exam Preparation. This part concentrates on Questions on general interview questions for structural engineers on the topic Prestressed Concrete. 1. In this method, the prestress is introduced by bond between steel & concrete. 2. In this method, the prestress is imparted to concrete by bear ing. 3. What type of stress is directly introduced by prestressing? 4. 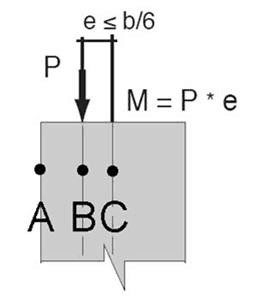 Precast members are typically stressed using which method of tensioning? 5. Pre-stressed concrete members usually contain what type of reinforcement? 6. Where will the stress value be greatest in the column in the image under eccentric load P? In a fully prestressed concrete beam, how much of the cross sectional area can be considered effective? Pre-stressing a concrete beam primarily adds what type of stress to the section? 10. Concrete is the most common prestressed material.